New York – Burma’s peaceful elections were the high point of a year that saw the overall human rights situation in the country stagnate, Human Rights Watch said today in its World Report 2016. The opposition National League for Democracy (NLD) under Aung San Suu Kyi won an overwhelming victory in structurally flawed but procedurally free nationwide elections. However, the number of political prisoners rose, repressive laws were used to suppress peaceful dissent, and discrimination against ethnic Rohingya Muslims expanded. Burma’s November 8, 2015 elections resulted in few reports of intimidation, violence, or irregularities. Party rallies were conducted peacefully throughout the country, and there were no significant curbs on freedom of expression or the media. Election observers found polling and vote counting was conducted in a transparent manner. However, the government’s failure to amend the undemocratic 2008 constitution meant that the military still appointed one-quarter of parliamentary seats, and a number of senior ministerial positions were reserved for serving military officers. Left out of the election were more than 800,000 disenfranchised Rohingya and other minority voters. Changes in political party laws and enforcement of the discriminatory 1982 Citizenship Law meant that at least 50 Muslim candidates were rejected during candidate eligibility screening. 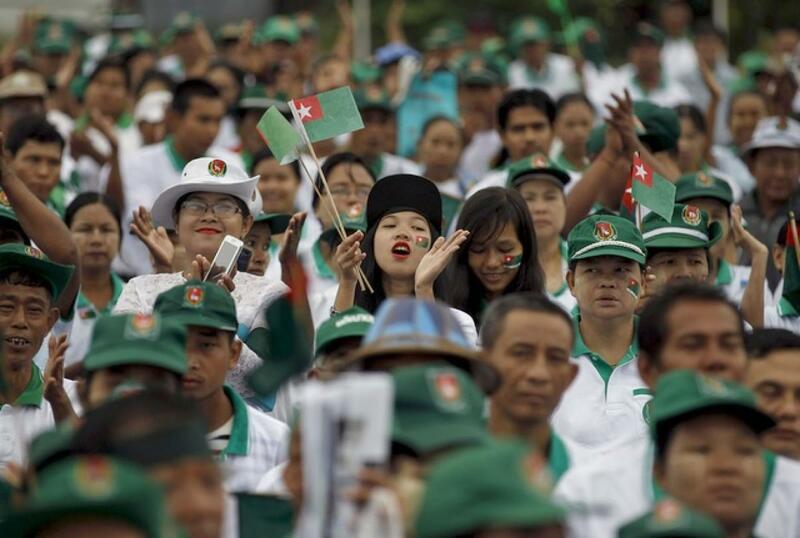 The two largest parties, the ruling Union Solidarity and Development Party (USDP) and the NLD, did not field a Muslim candidate anywhere in Burma, and no Muslim candidate was voted into parliament nationwide. The government’s 2015 passage of the discriminatory, rights-abusing “race and religion laws” (the Population Control Law, the Buddhist Women’s Special Marriage Law, the Religious Conversion Law, and the Monogamy Law) deepened the marginalization of Burmese Muslims and energized Buddhist ultra-nationalists led by monks in the Association for the Protection of Race and Religion (Ma Ba Tha) movement. The maritime flight of Rohingya dramatically increased in 2015, with families departing from Burma on smuggling vessels, at times joined by large numbers of Bangladeshi Rohingya and migrant workers. The United Nations estimates that 94,000 people made the journey between January 2014 and May 2015. In May, some 5,000 to 7,000 people on boats were abandoned by smugglers and denied entry to Thailand, Malaysia, and Indonesia, with at least 70 dying during the ordeal. The number of political prisoners increased in 2015. At year’s end, an estimated 112 people were incarcerated in violation of their rights to peaceful assembly and other fundamental freedoms. At least 486 more were facing trial mostly related to land rights protests. A violent police crackdown on student protesters in March resulted in the arrest and ongoing trial of more than 50 student activists.